All I want for Christmas is…a drone! You’ve unwrapped your gifts from under the Christmas tree and you got just what you wanted—a shiny, new Drone. Unmanned aircraft (aka ‘drones’) are one of the hot ticket items for Christmas this year with everyone from Harvey Norman to Big W selling them in one form or another. Previously the domain of the skilled hobbyist, they are now available for everyone to operate, with controls ranging from smartphones to tablets to PlayStation-type thumbpads. But before you rip that drone out of the box what are the rules and the regulations that you need to know here in Australia? A model aircraft is a drone used for sport and recreational purposes only—the category for all hobbyists. 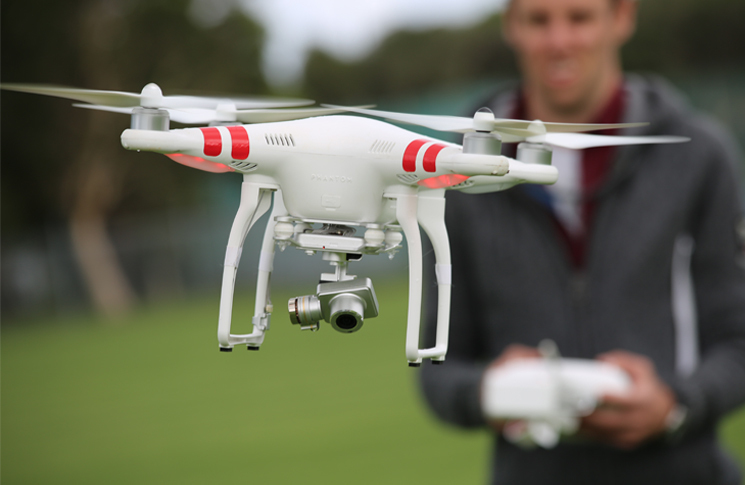 If you are not using your unmanned aircraft for sport and recreational purposes then you are operating a remotely piloted aircraft (RPA) and require CASA certification. It is illegal to fly for money or economic reward unless you have this certification. Also making Santa’s naughty list this year are drones controlled through first person view (FPV). FPV is an unmanned aircraft fitted with live video equipment—enabling the pilot on the ground to fly it as though they were in the cockpit. A basic FPV system includes a camera and a video transmitter on the aircraft with a video receiver and a display on the ground. More advanced FPV systems have on-screen displays of GPS waypoint navigation, flight data, and aircraft telemetry. The operator uses video goggles or a screen to control either a fixed-wing or multi-rotor UAV, although almost any model aircraft can be modified for FPV. FPV allows the operator a pilot’s view of the world—just like an actual pilot on board an aircraft. However, the operator does need to maintain visual line of sight (VLOS) contact with the unmanned aircraft. The technology does allow an FPV aircraft to be flown well beyond visual line of sight (BVLOS), limited only by the range of the remote control and video equipment in use. However, under current Australian regulations this is not allowed. Flying beyond the visual range of the pilot clearly raises some safety concerns regarding FPV. Recently, there have been recorded instances where people have operated an FPV—clearly going against the regulations—by flying their machines in controlled airspace and operating close to commercial aircraft and helicopters. CASA takes this matter seriously and regularly issues aviation infringement notices (AIN) against rule breakers. ‘In a recent incident, an FPV operator lost controlled of his model aircraft which flew the Sydney Harbour Bridge, hit the Bridge stanchions and finally landed on the railway tracks,’ says Kevin Scrimshaw—CASA’s sport aviation safety assurance officer. The operator was also fined $850. To learn more about the differences between RPAs, UAVs, drones and model aircraft, along with additional safety information, please visit CASA’s website or download our Flying with control? Get to know the rules flyer. For further clarification of where and how a model aircraft or FPV can be flown contact CASA’s sport aviation team via sport@casa.gov.au. Its such a wonderful idea to make Christmas more enjoyable. It is an interesting way to make good use of technology.